2017 was the warmest year on record for global oceans according to an updated ocean analysis from the Institute of Atmospheric Physics (IAP) of the Chinese Academy of Sciences. 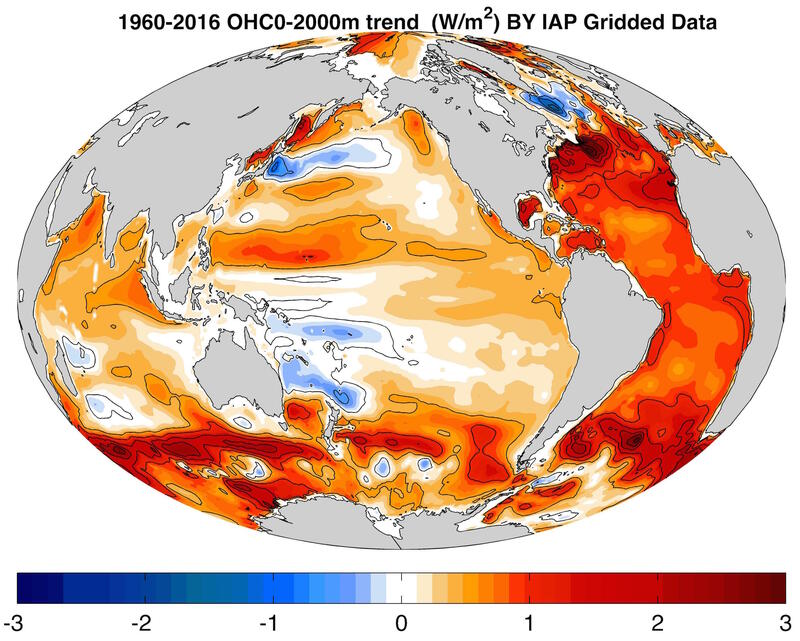 The oceans in the upper 2000 m were 1.51 × 1022 J warmer than the second warmest year of 2015 and 19.19 × 1022 J above the 1981–2010 climatological reference period. Owing to its large heat capacity, ocean accumulates the warming derived from human activities; indeed, more than 90% of Earth’s residual heat related to global warming is absorbed by the ocean. 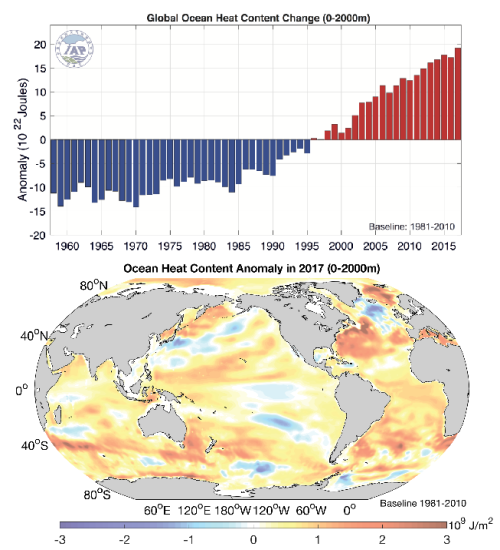 As such, the global ocean heat content record robustly represents the signature of global warming and is impacted less by weather-related noise and climate variability such as El Niño and La Niña events. According to IAP ocean analysis, the last five years have been the five warmest years in the ocean. Therefore, the long-term warming trend driven by human activities continued unabatedly. The increase in ocean heat content in 2017 occurred in most regions of the world (Figure). Human greenhouse gas footprint continues to impact the Earth system. 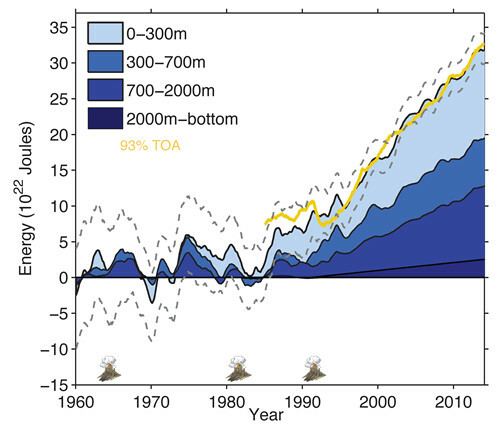 Increases in ocean temperature cause ocean volume expansion, which contributes to the global mean sea level rise. The increase in ocean heat of 1.51 × 1022 J in 2017 resulted in a 1.7 mm global sea level rise. Other consequences include declining of ocean oxygen, bleaching of coral reefs, and melting of sea ice and ice shelves. Scientists examined the ocean heat content change on decadal and multi-decadal scales and at different ocean basins and find that the oceans are robustly warming, regardless of which data was used. 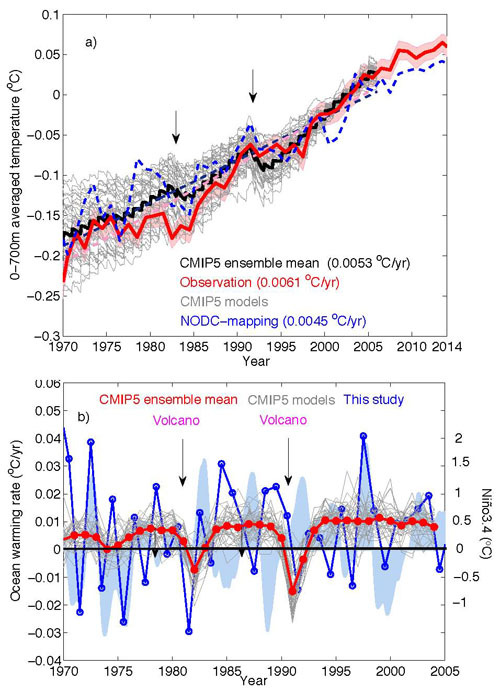 Scientists reduced the errors in Ocean heat content estimates, including corrections to the systematic biases in expendable bathythermograph data, filling gaps in the data, and choosing a proper climatology.